Tyler Barker is hoping local lawmakers can see things from his perspective. Mr. Barker, a long-time advocate for a fully accessible community and chair of Aurora’s Accessibility Advisory Committee, wants Council to take a second look at plans for Library Square before they are set in stone to make sure access to the new community space, and indeed the associated buildings that bookend the plans – the Aurora Public Library and the expanded Church Street School – are as accessible as possible for Aurorans of all abilities. Plans for Library Square were approved in principle by Council last month. In addition to a three-storey expansion to the Church Street School, plans for Library Square itself include an open piazza between the two landmark buildings, which will provide a community gathering space adaptable for many purposes. Parking currently situated between the two buildings will be moved to the east of the site, roughly to the footprint of the former Aurora Seniors’ Centre/Fire Hall building, which was recently demolished, along with the old Aurora Public Library building, to make way for the redevelopment. Accessible parking for the Library, which is currently just outside the rear entrance to the current library facility, is slated to be moved to the north of the building, off a laneway that will be constructed as part of the Library Square development. This plan to relocate the two fully accessible parking spots to a potentially busy laneway further away from the building, however, falls well short of the mark in Mr. Barker’s view, and in the views of his committee members. 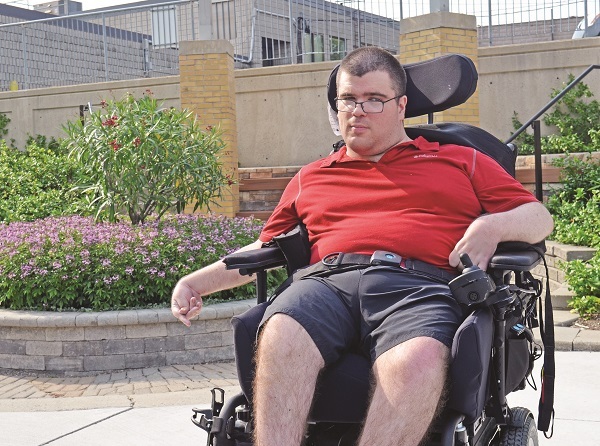 The Accessibility for Ontarians with Disabilities Act (AODA), he says, calls for making accessible parking as close to overhang protection as possible to protect individuals using mobility devices – in Mr. Barker’s case, an electric wheelchair. This is another area he says the Library Square plan falls short. “Just last June, I was coming out of my grandmother’s retirement home and [the accessible parking] was really close to my van, but I was only out there for a minute in a torrential downpour and my wheelchair fried, the mechanism didn’t work, so we had to literally tow me up my ramp because the power was fried,” he says. “Thar would be a big challenge for me and others in my situation if the weather is bad, or if the weather just turns. The issue of accessible parking in Library Square has been a hallmark of recent debates over the issue, including the meeting leading to its approval, and Councillors John Abel and Wendy Gaertner being among those raising the loudest alarm bells. From the perspective of fellow Accessibility Advisory Committee member James Hoyes, the Committee never had a chance to provide formal comment on either of the two original Library Square concepts, prompting Mr. Barker to take his issues directly to a Council meeting. Meeting with Councillor Kim, Mr. Barker and Mr. Hoyes suggested a few modifications they believed could be made to address the issue, including bringing the accessible parking spaces in just a few metres out of the laneway closer to the Library.